Do you find yourself recharging your batteries when you’re alone, or do you recharge in social situations, or maybe you recharge in both situations? I’ve always seen myself as an introvert, I like being alone and have lots of alone time to recharge. But lately, I’ve come to doubt that idea. I’ve known that I can get energy when I’m together with friends in a social situation and that I often have to recharge after such circumstances. There is, however, quite a few exceptions to this. 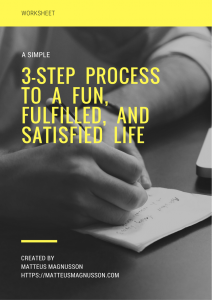 When I’m attending a Toastmaster meeting I seldom want to go to the event—I just want to stay at home—but when I’m there I always leave with more energy than I had when I arrived. If I’m introverted, I shouldn’t get energy when I’m social, or should I? A similar thing happened when I went to two workshops last year held by Steve Pavlina. 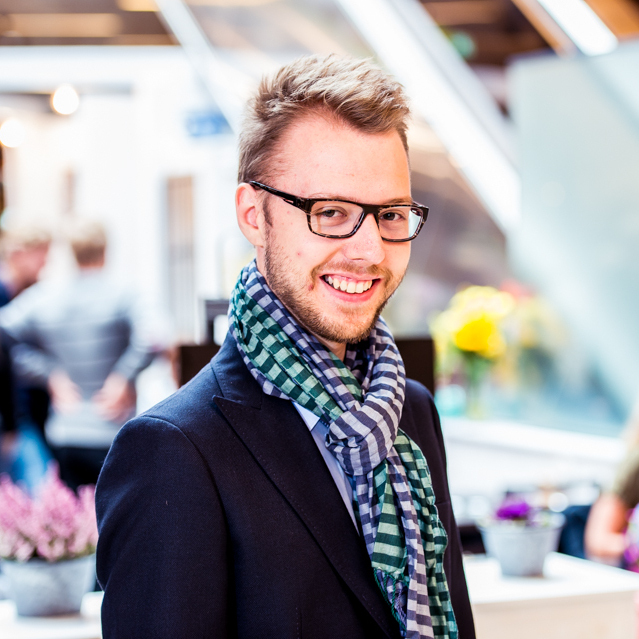 The first workshop spanned from Friday–Sunday, and then we were free Monday–Thursday. On Friday the second workshop started and ended on Sunday. Between the workshops, I attended a Wilderness Workshops by Kevin Ford on Monday. All in all, I was social from almost early morning to late evening (not night) from Friday to Wednesday. I always left with a lot of energy, but I also found myself glad to be alone when I came home. It wasn’t until Thursday that I had to take a full day staying mostly inside my hotel room. 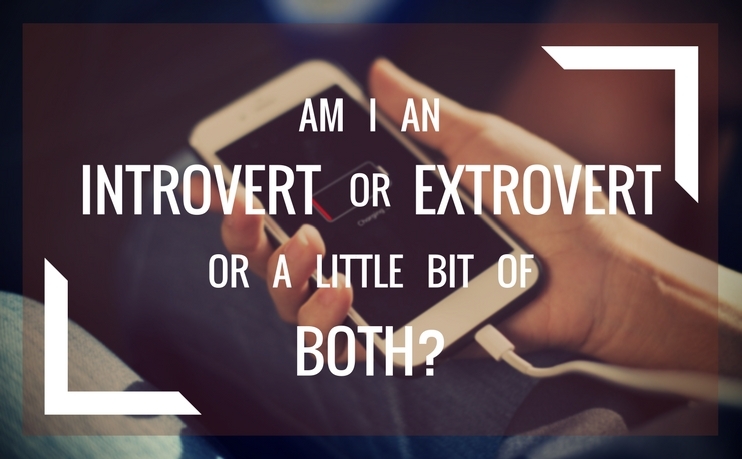 What I’m wondering is, am I introverted or extroverted? I want to stay home, but when I go to social events I rarely (once in a hundred times) regret that I did go. I leave with more energy, motivation, and often I’d like to start or continue with a project when I come home. At the same time, I can get exhausted by some social events quite quickly and have to go home to recharge. This is particularly the case for networking events where I don’t know many people and only get to know a few people on the surface. So I get energy both from being alone, but also from being social. Why does matter if I’m an introvert or extrovert? Partly because I want to know; I like knowing how things work, especially how I work. What motivates me, what do I get energy from, how can I keep my motivation, etc.? But it’s not only that I want to know. I want to be able to use that knowledge to my advantage. For example, if I don’t have any energy or motivation to do anything, I want to know what I can do to get the energy and motivation. For example, when I’m in this state do I get a consistent result if I call a friend, join a social event, or when I stay home and read a book instead? Instead of treating the symptoms (lacking energy and motivation), I’d rather have a balanced life where I don’t get low on energy as often as it happens today. For example, a typical week might be to be in a social situation (read: a situation with more than two people) and have some alone time the rest. Of course, it won’t be that static. Some weeks, an ideal situation would be to be social five times, other weeks zero times. In essence, the label “introvert” or “extrovert” doesn’t matter as much as the description. 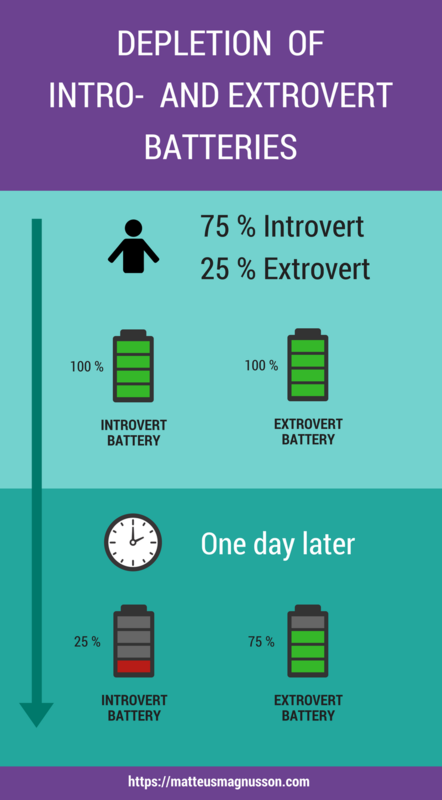 For a long time, I’ve had this idea that everyone has one introvert and one extrovert battery. Note, that this is just my speculation and it’s not based on science. Still, I keep coming back to this idea again and again; maybe because it makes it possible to have both introverted and extroverted sides at the same time. To run at full energy (efficiency) both batteries have to be fully charged. If you’re more inclined to introversion, you will use more of that battery and therefore charge the introverted battery more often. Here’s an example. Of course, things aren’t this simple in reality. If you spend an entire day on introverted activities such as reading, painting, playing games (by yourself) your introvert battery will recharge. If you, spend a few hours being social, your introvert battery might get depleted and your extrovert battery fully charged. Thus it’s almost impossible to have these two batteries be fully charged at the same time. When I try out a personality test I often end up as an INFJ being around 60 percent introverted and 40 percent extroverted. Although, when I took the test today, I got the reverse; 60 percent extroverted and 40 percent introverted. I guess that it can change daily; both due to hormones and how well I’m feeling. If I catch a cold, most of the times I want to be alone. I know I used to be very social when I was a child. That might be the only occasion where I could feel “I want to play with some friends.” But I also thought it was fun to play alone. So what I’d like to do is to balance the two batteries, trying to keep both above 75 percent most of the time. To do this, I have to schedule a few hours of social interaction almost every day, especially in my work. Which is one of the reasons why I started to coach; to get more social interactions. Scheduling activities mean I have to force myself to be social, and since I get energy from that, I think it’s okay to force myself. Come to think of it; it’s almost like doing a workout. Sometimes it’s tough to start, but when I have started I don’t regret it, and I get energy from it. Something I want to be able to do is to gauge the state-of-charge of the extrovert battery. To get a better feeling how full or empty the battery is, instead of fumbling in the dark. Knowing the state of the extroverted battery allows me to be spontaneous and help with the decision-making. Should I stay at home or be social this evening? The problem is that I don’t have any ideas at all how to measure the battery state. I can’t go on how keen I am on meeting people because usually, I am not very keen. Another idea is to measure the amount of energy I have. If I don’t have any energy, my extroverted battery is probably empty. But that doesn’t sound like a good measurement. How does your situation look like? I’d also get some feedback on the idea as I’m not sure it does make any sense to someone that’s 80 percent or more introverted or extroverted. ← What Advice Would You Tell Yourself If You Were 10 Years Older?